ISLAMABAD/KARACHI: Islamabad High Court’s (IHC) Justice Shaukat Aziz Siddiqui on Friday said that Chief Justice of Pakistan (CJP) Mian Saqib Nisar has no right to insult judges during court hours. 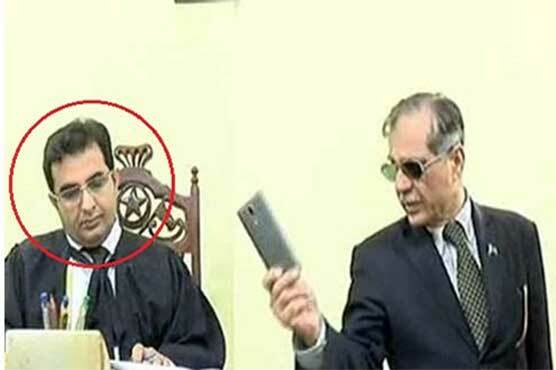 Justice Siddiqui, who is facing a misconduct reference in the Supreme Judicial Council (SJC), was referring to an earlier incident in which the CJP had tossed the mobile phone of Additional District Judge Gul Zamir Solangi during the court hours. IHC judge’s remarks came after a similar condemnation by the Karachi Bar Association, wherein the legal fraternity asked the CJP to refrain from such antics as they are not helping judiciary. The IHC judge, during a case hearing, said that he wanted to make a heartfelt appeal to the CJP. “If he doesn’t respect us, then we reserve the right to come to our institution’s rescue,” added Justice Siddiqui. The KBA resolution, while referring the mobile throwing incident, condemned the CJP’s action, saying that the bar association supported transparency and accountability but not by carrying on a “reality show on live television”. “His [CJP’s] behaviour with judges of lower courts should not resemble an SHO [Station House Officer] disciplining a constable or that of a wadera with his haris,” the resolution further read. KBA’s resolution also lamented that as a result of “such public humiliation”, Sindh “lost a fine judicial officer”. “The act of pointing out individual judges like this has not only demoralised judges of the subordinate judiciary but also of the high courts,” Rizvi further added. “The spirit in which the CJP visited Larkana was correct and it is true that our lower judiciary needs reform but the manner in which the CJP handled the situation is open to critique and he himself must think about such actions,” Advocate Rasool told Pakistan Today. The SC registrar was approached for comment on the issue but he was not available. Moreover, the KBA condemned CJP’s “instruction to all courts of not granting ex-parte injunctions in China-Pakistan Economic Corridor (CPEC)-related matters”. It denounced Justice Nisar’s assurance to his Chinese counterpart that the judiciary in Pakistan supports them, saying that the judiciary can neither support nor oppose any foreign power or investment programme but merely decide cases before it in accordance with the law. Last month, Justice Nisar had met his Chinese counterpart, Supreme Peoples Court of China President Zhou Qiang, in Beijing while on an official visit to China. “The judicial system is being disturbed with actions like these,” Rizvi added. “Lengthy litigation deters foreign investment but every case must be decided on its own merits,” Rasool explained. In its resolution, KBA endorsed Justice Asif Saeed Khosa, who had said that the “final frontier” of judicial independence was when judges would be enabled to decide cases without having to toe the line of the institution to which he belongs.